With less than two weeks to go before Austin’s stricter vehicle-for-hire ordinance goes into effect, a group backed by Uber and Lyft says it has collected enough signatures to overturn or force a public vote on the new rules. With less than two weeks to go before Austin’s stricter vehicle-for-hire ordinance goes into effect, Ridesharing Works — a group supported by Uber and Lyft — says it has collected 65,103 signatures on a petition to overturn the new regulations or force a public vote on them. If enough signatures are certified, the petition would force city leaders to choose between reverting to looser ridesharing rules adopted in 2014 or putting the new ordinance up for a vote on May 7. Once the city clerk’s office has validated the signatures, the Austin City Council will have 10 days to make a decision. In December, undeterred by claims from Uber and Lyft that they might pull out of Austin, the council voted 9-2 to require vehicle-for-hire drivers to pass fingerprint-based background checks. Ridesharing Works gathered signatures from Austin voters between Dec. 28 and Jan. 17, according to a press release. City and state law requires a minimum of 20,000 signatures to reverse the ordinance or hold an election. Despite gathering triple the amount of signatures needed, Ridesharing Works will submit 23,000 signatures to the city clerk. 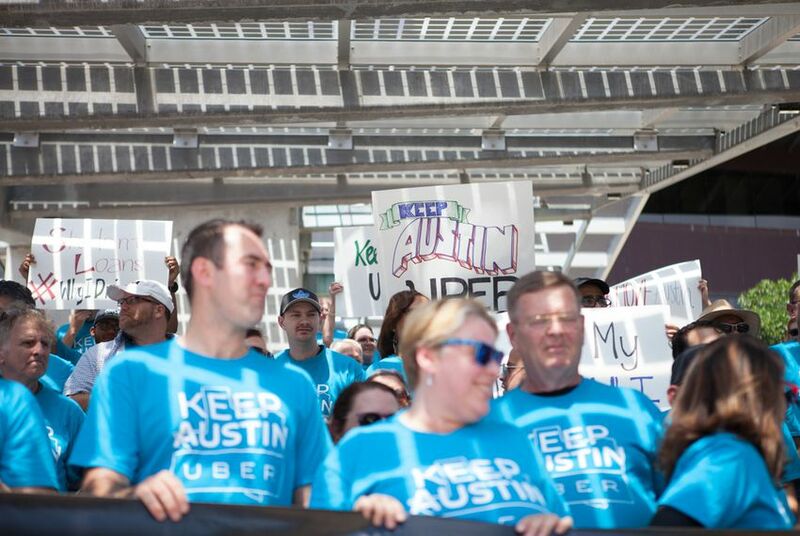 “It’s clear that ridesharing has become a relied-upon service for Austinites all across the city, and that many disagree strongly with the recent Council action,” said Caroline Joiner, treasurer of Ridesharing Works. Ridesharing Works plans to formally announce the petition results at 9:30 a.m. in front of Austin City Hall. The last successful citizen petition in Austin was the drive for a 10-1 city council redistricting proposal in 2012. It took 10 days to validate the signatures, and the proposal was ultimately passed by voters. Correction: The dates between which petition signatures were collected was misstated in the original version of this story. Signatures were gathered between Dec. 28 and Jan. 17, not Jan. 27.